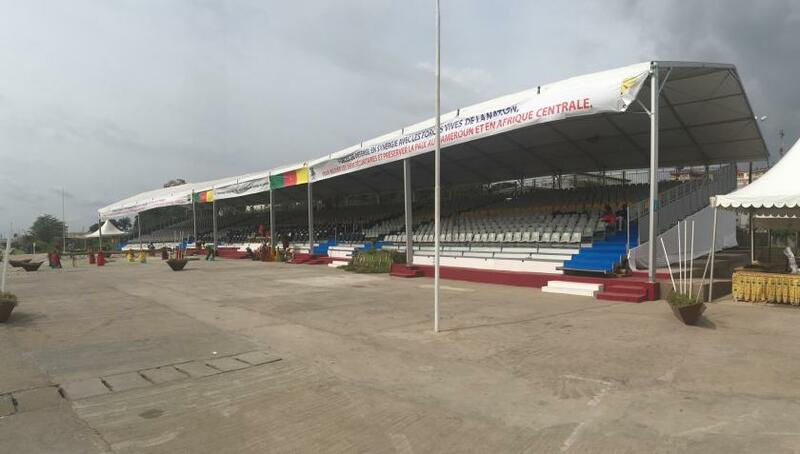 For the National Day of Cameroon, which took place May 20, 2015, ALCOR delivered a covered modular grandstand of 2,000 seats. This grandtand with unique angles was unanimously hailed by political leaders of the country and was the subject of a very strong media coverage. Managed jointly by ALCOR and his Cameroonian partner 2ME the company headed by Constant Moukoko, this modular tribune and its roofing was mounted in five days. it was equipped with VIP seats, presidential platform, emergency stairs and fans. 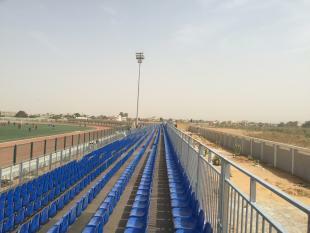 The urban community of Douala, has already announced a multi-year investment program to enrich this modular grandstand. Initially planned to be dismantled after the national ceremonies, this Alcor grandstand should ultimately remain in place as a local monument to visit. La communauté urbaine de Douala a déjà annoncé un programme pluri-annuel d’investissements pour enrichir d’options cette tribune démontable. Prévue initialement pour être démontée après les cérémonies nationales, la tribune modulaire Alcor Équipements devrait finalement rester en place comme monument.